Inflation has kind of become a Yamraj (the god of death) – It is gaining in strength day by day and taking a toll of things. Obviously, you have heard of onions touching close to 60 rupees a kg and Garlic going upwards 300 rupees a Kilogram. Now, with those rates you can imagine what value does the humble chaar ana (25 paise coin) have in today’s world. Absolutely nothing! Infact, the only ones who are now benefitting from 25 paise coins are the scrap dealers. They can now melt the 25 paise coins and even if they sell it as raw steel, they get more money. In short, the cost of manufacturing a 25 paise coin is much higher than its actual face value. So, the government has now decided to kill the 25 paise coins. 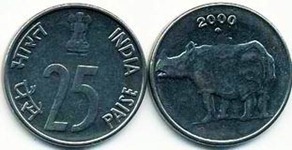 According to the latest announcement by the Government, all the coins of denomination of 25 paise and below, issued from time to time, will go out of circulation with effect from June 30, 2011. Consequently, from June 30, 2011 onwards these coins will not be accepted in any transactions. The minimum denomination coin acceptable for transaction will be 50 paise from that date. Also, in accounting, i.e. the entries in books of accounts, pricing of products / services / taxes shall also be rounded off to 50 paise or whole rupee from that date. Any bets on how long will 50 paise coin survive ? "Inflation forces 25 paise coins out of circulation! ", 5 out of 5 based on 1 ratings. please tell me the suitable price of these notes of rs 10 .
this happen only in india. I have a coin of one rupee made in1979.How much price you give me? Is Rs.10, the new 25 paisa in India? When I come to India on vacation, I just get a shock for any good/ service I purchase -the Rupee seems to be so devalued. Hope the Govt. takes steps to control inflation. In andhra pradesh also 50 paise coins also not accepting. In Bihar even 50 paise coins are not accepted..
50 Paise coin is already not accepted in so many states, i.e. Chhattisgarh, M.P.